These collected reports summarize the mathematical physics work of Jim Fisher describing the elementary electromagnetic wave forms, the leptons and the photons. The mathematical approach of this work is completely outside of the standard hypothesis-first top-down procedure of doing mathematical particle physics for the last 30 years. The methodology used by Jim Fisher could variously be described as; a correlative mathematical analysis of the data, a data-first approach, a non-hypothetical approach to particle physics, or a pragmatic engineering approach to particle physics. As a result of 14 years of intense research efforts Jim Fisher has discovered mathematical-geometric equations which give exact descriptions of the masses and charge of the leptons. Before now, humans have never had any intellectual explanations for their experience of these two most basic properties of these elementary units of matter. The Laguerre orthogonal polynomials, which are solutions to second order differential equations, have been used to step thru the lepton mass series of electron, muon, and tau. Thus a person could say that the mathematical solutions for mass which were found are essentially quantum mechanical in nature. Additionally the geometric forms found for both the leptons and the photons consist of spinning radial-angular plane waves, which propagate into space with time. Thus a person could say that these two elementary energy forms could be ascribed as being membranes of the string-membrane school of hypothetical particle physics. Further the mathematics describing the masses of the leptons and the (ML)(L/T) of the photons are almost identical. Only what are almost trivial changes need to be made in their mathematics to swap between these two basic classes of electromagnetic wave forms. Yet at the same time, these mathematical changes point towards the many strikingly different physical properties between these closed and open ended forms of energy wave patterns. Finally the equation found which exactly describes the charge of the leptons begins from vector origins and results with an invariant fixed numeric, as required. Additionally these reports describe the origins of a ternary force interaction constant amongst the three basic forces gravitational, electrical, and magnetic. This interaction constant, which has here-to-fore been undiscovered, appears to underlie the wave form structures of both the leptons and the photons. This work is important because many future avenues of particle physics research have now been opened. For example, a four column Periodic Table of the Elements of Physics (PTEP) is now conceivable, with the leptons filling the second column. The neutrinos would fill the first column and the two classes of quarks the last two columns. Brief investigations have shown that dark matter or energy might be possibly be explained by the mathematics of hypothetical upper members of a photon series analogous to the lepton series. These collected reports of the mathematical physics research work of Jim Fisher present the ultimate physical property equations which were discovered for the 5 principle physical properties of the elementary electromagnetic particles; e, me, mμ, mτ, and h. Additionally an equation for the universal ternary interaction force constant between the gravitational, electrical, and magnetic forces is specified. These equations form the core narrative of this body of work. The equations are presented and then parsed into their various factors. These factors are thoroughly discussed to ensure their correct understanding and use so that the reader can reproduce the research findings if they so chose. The equations are set into the contexts of consensus space and time and given interpretations as to the probable meaning of their mathematical quantities in terms of the “real” world. All the equations are carried from blackboard mathematics, conceptual spaces, to the real world, physical time and space, by use of scaling constants. These equations are simply presented as the result of many years of correlative research efforts. They are not derived in the usual step-by-step fashion of hypothetical physics presentations because they did not flow from hypotheses. Never-the-less, the numerics of all the calculus-mathematical-geometric blackboard quantities are rigorously proven to be universal, measurement system independent. That is these conceptual quantities come with meta or place holder units and can be placed into the absolute and relative scale systems of any species of inquiring beings. Many reports/chapters are devoted to the necessary proofs which flow from the analysis of measurement systems and the meanings and definitions of various scientific units. Separately away from the formal mathematical equations several reports/chapters are devoted to speculations, implications of this work, and future work which can flow from it. Likewise a few other reports/chapters give a personal perspective on the 22 years of the project effort, and a short outline of the methodology and criteria used to guide the correlative trial and error efforts from which ultimately the equations were pieced together. While the final resulting equations are the main story here, how and why they were discovered without resorting to any of the typical assumptions and procedures of hypothetical particle physics is of great value to science in itself. This research work was carried out in private by Jim Fisher from July 4 1991 until February 19 2012. This research effort was essentially continuous over the entire 20 1/2 year period. 1 The first 12 1/2 years of the research work were devoted to discovering a correlation for the masses of the three known leptons; me, mμ, and mτ. Incidentally, after about 6 years the first equation discovered for a physical property of the basic electromagnetic particles was that for the elementary charge of the leptons, e.
2 After finalizing the discovery of the equations calculating to the lepton masses, then about another 1 1/2 years was involved in discovering-developing an equation describing the fine structure constant α. This then ultimately leads to the constant for the (ML)(L/T) for the photons, the Planck constant h.
3 After that, about another 4 years was needed to lay out the underlying mathematical nature of the ternary force interaction constant which appears to be involved in the structures of both of the classes of electromagnetic particle. 4 Finally the last 4 1/2 years of this research project involved analysis of systems of absolute measurement units to demonstrate the universality of the mathematical-geometric results used in this work. A rigorous proof was developed for the measurement system independence of the units used with calculus-geometric quantities of this work. That is, for those absolute measurement systems based upon SI analogous relative measurement systems. 5 Additionally during the last 6 1/2 years of the project the work of others in academia was studied to better understand what their objections to this work were and why these objections even arose. All of the research efforts to find the objective numerical values with their units of the five physical properties for which precise mathematical equations were discovered required intense mathematical-calculus-geometric trial end error searches. These searches involved pin-ball like mixes of mind numbing intellectual efforts and completely non-scientific intuitive endeavors. This work of this project was solely that of Jim Fisher. The only outside assistance received was from a few non-scientific friends in the form of a several hypnosis sessions to help visualize some of the geometric forms which became some of the critical findings of this complete work. Occasional off-the-cuff discussions were indulged in with coworkers concerning mathematics in the realm of beginner’s electrical engineering. Additionally coworkers helped in the first several attempts at formal publication of the results of this work. Specifically this work did not involve the advice, assistance, or input of any credentialed or published academic hypothetical physicists. No outside financial sponsorship of any form was received, neither from governmental bodies, corporations, non-profits, nor from private individuals. The mathematical approach of this work was completely outside the standard top-down procedure of the last 30 years for doing mathematical particle physics. This approach, the only approved one, has been hypothesis-first or equally make assumptions first. This methodology of the old style hypothesis-first schools of thought has been; start with the unknowns (assume things) and work towards the knowns (the data). The methodology used by Jim Fisher could variously be described as; a correlative mathematical analysis of the data, a data-first approach, a non-hypothetical approach to particle physics, or a pragmatic engineering approach to particle physics. This correlative data-first approach started with the knowns and worked towards the unknowns. The knowns are the physical property data of the particles. The unknowns are the mathematical-geometric structures of the fixed wave forms, the particles, which were assumed to exist and were hoped to be found. 1 Any equations developed must match (predict) the objective quantities to many decimals of accuracy, preferably matching that of their measurement. 2 Every mathematical factor in an equation must be identifiable as having some plausible physical-geometric origin or correspondence. 3 Of great importance, the final body of equations needed to be interlocked and display underlying patterns. 4 Likewise any equation discovered was prohibited from containing any arbitrary or unexplainable numerical constants, such as the number 42, and also could not create circular references. 5 Probably most importantly, any equations giving descriptions of physical properties for the elementary particles could not either predict or invoke the use of anomalies at odds with known science or physical common sense. Thus requiring 9, 10, or 26 spatial dimensions to describe sub constituents of the consensus world was prohibited. The mathematical particle physics research work of Jim Fisher is utterly different in its approach from all other calculational particle physics work of academia in the following manners. 1 First and most importantly this work did NOT use a hypothesis-first methodology. The methodology of this research work was to use trial and error mathematical-calculus-geometric searches to initially match the shape of the curved plot of the three known lepton masses. This trial and error effort was intentionally a no holds barred, all ideas are fair game, open ended search. No preconceived molds, models, or frameworks were to be used to find the physical-mathematical-geometric nature of the leptons’ wave forms. Likewise no assumptions were made as to the correct or applicable field of mathematics which would result in the correlation of the lepton masses. Ultimately the highest level of mathematics that was needed was second semester calculus and analytical geometry. 2 A second distinct difference and another key criterion of this work was that of restricting all work to a very limited scope. All the initial mathematical research work was to stay strictly focused on searching for a correlation for the masses of the three observed leptons. The use of or speculations about of the masses of the other known elementary particles, such as those of the neutrinos or quarks, were prohibited. The invoking of unproven, speculative, or other hypothetical particles was prohibited. The existence or lack thereof of other particles, known or unknown, was to be completely irrelevant. In short, mathematically the specific properties of concern of the leptons were to be dependent upon the leptons themselves, alone, and upon the three a-priori force constants. The wealth of undisputable additional experimental data and the well established properties of other particles were prohibited from entering the mathematics of any equations to be found for the lepton physical properties. Further, the mathematics of an individual member within the lepton class of particles were not to have variables dependent upon or entangled with the mathematics of the other members from within that class. Likewise uses of or discussions about collision product scattering angles, relativity, and other such off topic matters were strictly prohibited. Discussions of the background or how the various classes of particles came about to be and other such matters were not to be involved. 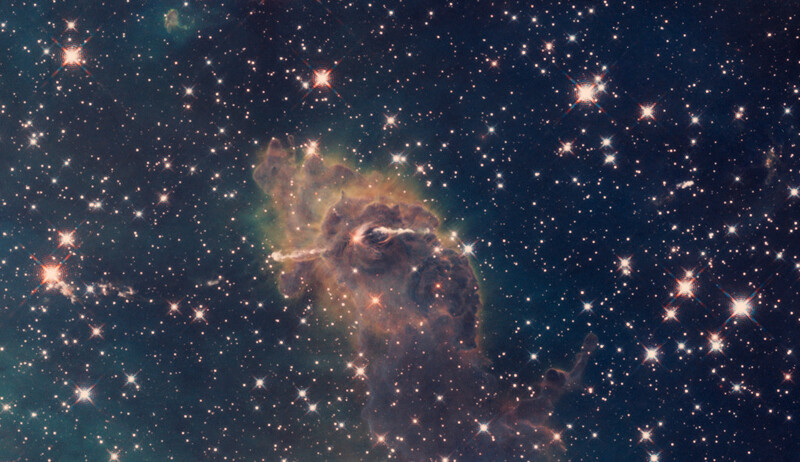 The age of the universe, what occurred during its first few instants of existence, the origins of the matter composition of the universe as is now found, et cetera were all to be completely irrelevant. Finally, grandiose discussions concerning nebulous religious-like guiding metaphysics such as a Grand Unified Hypotheses of Everything were to be utterly avoided. 3 A third unique feature was that of assigning parametric units to the results of mathematical-geometric equations. These assignments involved units from both the relative SI set of scales and also from absolute or “natural” subatomic physics scales. That is, quantities resulting from mathematical expressions, factors within equations, etc, were not forced to be unitless ratios nor involved other such mathematical trickery which results in meaningless sterile numbers. 4 A fourth critical difference was the involvement of G, the universal gravitational constant, when and where it appeared to be an inherent and necessary factor, such as being embedded in scaling constants. 5 This work used very common low level calculus and simplistic geometries in its mathematics. Tensors, imaginary numbers, probabilities, etc were not used in the mathematics, nor were discrete, disjointed, or otherwise discontinuous forms. Geometries only involved 2 and 3 spatial dimensions. 6 As a result of invoking only known consensus real world particles, using parametric units with the numerical outcomes, and easy to understand geometries, the results of this work are verifiable. This is a major difference from all assumption or hypothesis driven particle physics research. Matches for the several objective measured physical properties of the leptons and photons ultimately were discovered and placed into equation form. The correlative approach of this mathematical physics research work and the trial and error searches were successful in many other unintended ways. What is amazing is not that structural equations can be developed which lead to the exact calculation of the masses of the leptons in kg and the (ML)(L/T) for the photons in (kgm)(m/s), but that additionally all the component factors within these equations have real world meaning. All the component factors within the equations discovered have common simplistic geometric mappings to the physical world as humans understand it. Further, analyses of the various factors and implicit variables within these equations directly lead to explanations for many of the other observed physical properties of the waveforms. Thus the equations discovered lead to much more than just their precise target or objective numerical values. This work found that both the leptons and photons have definitive energy density structures. That is, the leptons are not mathematical points with no length, width, or height to which somehow magically quantum numbers and physical properties are attached. Likewise the photons were shown to have a mathematical component radial to their flight path and are not mathematical lines like wires with no widths. The general form of the geometric shape found for the energy densities of the leptons and the photons alike was that of a two dimensional radial-angular plane. These planes then spin and are propelled forwards in time. The resulting already well established appearance of the photons being that of an open ended or moving cylindrical spiral progressing in a straight line. That is in the absence of massive gravitational bodies. The leptons were found to progress in the next most simple and conceptually common path in terms of which humans think, that of a circle. Thus they form a closed loop and make the outline of a donut, mathematically a torus. In simple layman’s terms the leptons go forever in tight little circles like a dog chasing its tail. 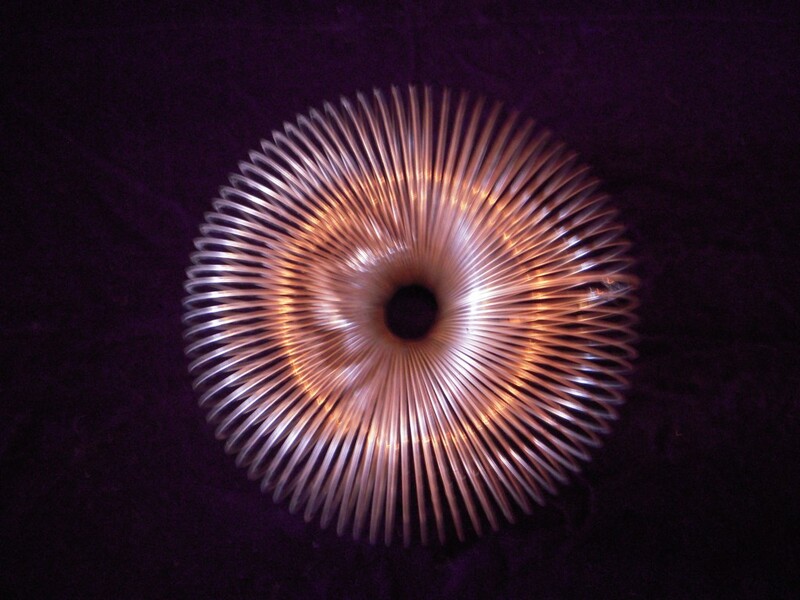 In terms of simplistic static demonstrations, a stretched out kid’s toy slinky could be used to represent the path of the photon’s energy structure and a slinky which has been coiled around end-to-end to make a donut to represent the path of the electron’s energy structure. Of course the higher members of the lepton series, the muon and tau, explode or self destruct before they get too far. This is because the outlines of their radial-angular energy density planes are not truly circular in nature but are actually flower petal shaped. Thus as they spin about their axes of progression, they tumble or flop around like badly imbalanced airplane propellers. Additionally these energy planes do not uniformly fade away as they extend outwards, but are bumpy with multiple highs and lows of their density patterns. Even more complicated and probably contributing significantly to the self destruction of these higher members of the series is the fact that the outline of their orbit or revolution about the center of their donut holes also are not circles, as with the electron, but again are flower petal shapes. Thus these wave forms progress more like high speed drunks trying to run around large daisy wheels all the while doing cart wheels. All the energy structure equations found for both the leptons and the photons have the same general mathematical form. In the most broad or general terms the numerical value of the objective physical property can be recognized as a product of two factors. There is nothing unusual about decomposing or parsing the value of a physical property into two such factors. In fact such practice might be considered mandatory. One factor is a scaling constant. The scaling constants turn what would otherwise remain as correlations into actual equations. These numeric constants with their units scale the correlations from the arbitrary sized realm of blackboard conceptual math-geometry to the consensus sized physical realm of humans. A simple example is the factor G found in the force equation F = Gm1m2/r2. Similarly there is the premultiplier 8m(π/h) in the Schrodinger wave equations describing possible electron shells for the hydrogen atom. The other factor of the general mathematical forms are numerically universal values which results from calculus-mathematical-geometric considerations. These are seen in the second part of the gravitational force equation above. Likewise the second part of the quantum mechanic wave equations, which is not shown, are purely mathematic or geometric-calculus in nature. Approximately 4 1/2 years were devoted to proving that the numerical values found by analytical geometry and calculus at the core of the physical property equations are universal or measurement system independent. This universality does require that the relative scales, underlying the absolute measurement systems used by the scaling constants, must be SI analogous. That is, the mathematical-geometric constants can be shown to have meta or place holder units of the mixed form; particle property with relative scale units / distance with absolute scale units. Thus these constants can be scaled into any arbitrary, but SI analogous, set of units invented by any species of conceptualizing beings. The scaling constants involved in this work use the three measured force constants G, εo, and μo, and the elementary charge e as a-priories. These measured properties are then used to develop absolute physics scales analogous to the Stoney and Planck units for distance-length, duration-time, mass, and static quantities of charge (L, T, M, Q). In this work the absolute physics scales used are called Squigs units; lSgs, tSgs, mSgs, and qSgs. This private unsponsored non-standard mathematical particle physics research work of Jim Fisher has resulted in the following. 1 Equations have been discovered which describe, predict, or match several physical properties of the elementary electromagnetic particles to the decimal accuracy of their measurement. If the equations found are assumed to be totally coincidence or accident, then multiplying together the random chances for each decimal of each property, there are 5 chances in 10 (8 X 7 X 7 X 5 X 7) or 5 chances in 1013720 that this work is accidental and meaningless. 2.1 The leptons have mass. The photons are massless. 2.2 The leptons have a fixed electrical charge. The photons do not display a constant fixed electrical charge observable to, nor measurable by humans. 2.3 The leptons have a spin angular momentum ratio of 2:1 to that of the photons. 2.4 These equations can be used to directly examine the parity relations of both classes of particles. Additionally, this work can explain, at least qualitatively, the shortening half lives of the higher members of the lepton series. 3 A fourth member of the lepton series with a net positive mass is mathematically possible, but its stability is questionable due to highly complex angular wave patterns. Additionally one of this particle’s radial shells has a negative value. While mathematically possible, this brings into question as to whether such a particle can exist at all with an effective energy drain in its wave pattern. Should such a particle exist it probably would have such an extremely short life that it was never seen by older collider detection instrumentation. The mass for this fourth member was found to be approximately 4.647,568 x 10-30 kg which lies about 2% of the distance from the electron mass towards the muon mass. This particle would stabilize about 5 times more energy than the electron as compared to the approximate 207 times greater amount stabilized by the muon. This mass cannot be predicted exactly since there are only three lower members of the mathematical series, the electron, muon, and tau. Thus strong patterns have not been set for several of the particle’s radial energy shells. After this potential fourth member, the mathematics of the lepton mass series produced negative values or effectively explains the termination of the real world physical particle series. 4 A universal ternary force interaction constant has been specified and mathematically described. This constant (G/εo)0.5/μo = 2.184,555,091 x 10+6 (C/kg relative)(L/T absolute)2 appears to describe how the three basic forces (gravitational, electrical, and magnetic) interact as they assemble to form the electromagnetic particles. To grasp this concept an analogy to another well understood physical property constant can be made. The gas law constant 82.0575 (atm cm3) / (gmole K) describes the quaternary relationship of how the 4 parameters of pressure, volume, temperature, and molar quantity interact to form a body of gas. 5 This body of six equations for the elementary charge, the lepton masses, the photon (ML)(L/T), and the ternary force interaction constant is solidly cross linked. Specifically, there are many common identical mathematical factors in the equations for the electron’s mass and that for the photon’s (ML)(L/T). That is to say, to go from an open ended or moving photon wave pattern to the closed or bounded cyclic donut shaped form of the electron only requires a very few simple mathematical changes. For the elementary charge e, the geometrical calculus result is a constant, A =5.245,406,17 x 10-3 with the mixed relative per absolute physics units C2 lSgs-1. The scaling constant is [μo (G εo )1/2] = 3.054,438,950 x 10-17 lSgs / C. The final product is 1.602,177,29 x 10-19 C.
For the mass of the leptons, using the electron’s mass me as an example, the geometrical calculus result is a constant 1.861,432,180 x 10+5 with mixed relative per absolute physics units kg / lSgs. The scaling constant used for all the lepton masses is eμo(G εo)1/2 = 1.0 L_absolute = 1.0 lSgs = 4.893,752,96 x 10-36m. The final product is 9.109,389,239 x 10-31 kg. For the Planck photon constant h, the product of the radial and angular integrals is 68.517,994,75 (ML)(L/T) Sgs units. The scaling constant is e2(μo/εo)1/2= 9.670,562,404 x 10-36 SI / Sgs units. The final product is 6.626,075,440 x 10-34 (kgm)(m/s). 7 All the equations are placed in 2 and 3 dimensional mathematical-geometric spatial and temporal conceptual structures. These frameworks are in tern grounded in concrete references to the real world observed physical properties of the particles, the wave forms, of discussion. The resulting numerical values of the equations are in units of the common consensus real physical world, and are NOT in terms of probability space, momentum space, or other such conceptual and mathematical spaces. Further the equations, their independent and dependent variables never even start in such realms but are always confined to the quantities of L, T, M, and Q either absolute or relative. 8 This work does not either predict or invoke the use of anomalies at odds with known science or physical common sense such as; hidden, invisible, rolled up, or otherwise magical physical spatial dimensions. 9 Probably the most important finding of this entire body of mathematical research work is that the subcomponents of the consensus universe are simple and conceptually easy to understand and demonstrate. The mathematical-geometric aspects of this work, the wave forms found, can be explained to 6th grade students with a common kids’ toy, the slinky. This work is important because it provides mathematical definitions for the human experiences of mass and charge, the two most basic properties of matter. Exact mathematical definitions have long existed for the scientific concepts of velocity (d_position/dt), momentum (m x v), kinetic energy (m x v2), potential energy (m x distance x acceleration), etc. Over 100 years ago Einstein gave a mathematical definition for the general concept of subatomic energy, E = mc2. Many named equations exist for the interaction of electrical and magnetic quantities, such as Ampere’s Law, Coulomb’s Law, and Ohm’s Law. What are highly conspicuous by their absence are any definitions for the two basic concepts which are embedded in all these mechanical, subatomic, and electromagnetic definitions. In short all these mathematical equations, laws, and such are defined in terms of two other basic unknowns; mass and charge. Defining an unknown or a new quantity in terms of another unknown allows detractors to laugh at science. This work closes that gap and elevates science to a more solid foundation. In dealing with both macro human scale phenomena and subatomic reactions scientists hold dear as utterly sacred the two assumptions of the conservation of matter or mass/energy and of charge. There is total irony here in that the scientific, engineering, and general technical communities can say that a quantity is conserved when there has been no actual definitions for these quantities. This work closes this gaping opening thru which unscientific persons bent on discrediting science like to drive. 1 A four column Periodic Table of the Elements of Physics (PTEP) is now conceivable, with the leptons filling the second column. The neutrinos would fill the first column and the two classes of quarks the last two columns. 2 Brief investigations have shown that dark matter or energy could possibly be explained by the mathematics of hypothetical upper members of a photon series analogous to the lepton series. 3 Can the donut shape of the leptons be used to help explain anomalies or “violations” found in the results of various collider experiments? For example if all the electrons, or the muons, or the taus, line up “chocolate side” of the donut facing forwards as they fly down collider tubes, would they ever smash into their anti-particle partners coming at them in a side-to-side manner? Could these rare events be what humans are calling violations? 4 Knowing the geometric structures of the leptons, can their magnetic moments now be calculated from first principles? 5 Can a mathematical proof of the uniqueness of mass equations be developed using the fact that many factors within the mass equations appears to be solutions to differential equations.